Android smartphones today have a market share of over 80% worldwide. There are applications available for smartphone management from phone manufacturers as well as general applications supporting Android models. These applications generally have backup and restore functions for contacts, messages and other data. In many cases, smartphone management applications are useful especially in downloading large files from internet using desktop and transferring them to your phone. E.g: Music videos, apps etc. Downloading large files from smartphones using 3G internet will be expensive compared to downloading from home PC connected to broadband. Mobogenie all-in-one Android Phone Manager (Version: 3.3.1) is a Android phone management suite which boasts of extra features like rooting supported phones and a free PC cleaner software which frees space by removing junk files. It can backup and restore contacts, messages, music, pictures, videos, etc. It is a small download of around 33MB only. Installation is easy. The application is lightweight and launches fast. It prompts you to connect your Android phone to the system. Before connecting, many smartphones will need Windows drivers for the device to be pre-installed to be able to detect and configure mass storage and phone. 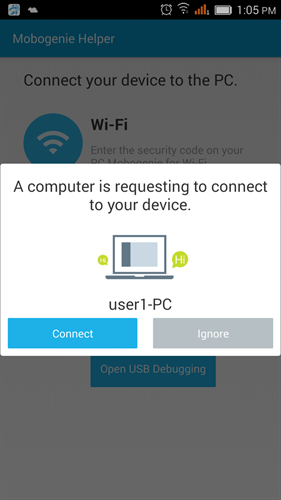 I connected the phone and USB debugging option needs to be enabled in the phone so that Mobogenie can establish connection with the phone. In home menu, a screenshot of the connected Android phone is shown. There is a refresh option which will show instantaneous screen of your device and screenshot capturing option also. The device and SD card memory information is also shown. There is backup, restore and file explorer icons shown in the home menu. 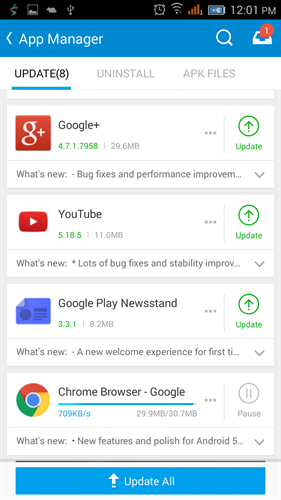 Apps menu looks like Google Play with top apps, categories and other listing options available. There are games, music menu which allows downloading and installing games and ringtones, music. Wallpaper menu has a large collection of HD wallpapers. YouTube menu opens a web page of YouTube.com inside Mobogenie. There is a download button present below videos loaded and it can download videos to the connected Android phone converting from FLV to supported formats by phone. Unlike similar applications, Mobogenie has a books menu which has books in different languages available. Books database is not really large and seems missing many great titles. E-books can be downloaded as .TXT, PDF, EPUB, MOBI formats. Genie menu contains Genie game which has few games and EPL live. 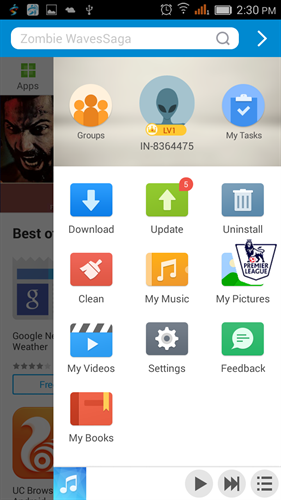 In the bottom section of the application, there are menus for contacts, messages, apps, music, pictures, videos and books available. My Contacts menu for example, has features like creating contacts manually, edit existing contacts as well as import or export contacts individually or as selected or full list. It supports .VCF format for contacts exporting and importing. Message can be exported in .CSV format. Messages menu supports sending and receiving SMS. It also supports group messaging. My Apps menu is elaborate with options to install, update, export Android apps. It supports installing .APK and .MPK app file formats. It can move applications installed to SD card. My Music menu can import most formats of music and convert to Android supported formats. One particular observation is, Mobogenie does these operations including converting audio or video formats and writing files to the phone without any extra prompting. There is a toolkit menu which has all the important options shown viz; backup, restore, file manager etc. Device information including IMEI and other informations is available with "About Device" context menu. You can batch install several apps or game files (.APK) with "Install App/Game files" option. Advanced options including support for rooting Android device and a PC cleaner is also available in toolkit menu. Mobogenie when connected for the first time to Android phone will install Mobogenie app for Android and Mobogenie helper which is used by Mobogenie PC version to connect to the phone using WiFi. I connected using Mobogenie helper app as it shows a random 4-digit number on a wizard walk-through session to connect to the PC. When the 4-digit number is entered on the Mobogenie, it connected and worked fine. I presume, transferring large files on WiFi will be slow compared to direct USB connection. Still, it worked fine although the screen capture of the mobile phone is missing and the application shows it cannot show screen capture when connected in WiFi mode. Mobogenie app installed on Android has similar menus as in PC version. It has apps, games, music, pictures, videos, books menu shown on top of the app UI. A context menu which contains My Music, My Videos, My Books, My Pictures and Update options is available on the top right hand side. Mobogenie Android app also has advertising running below the app UI. Mobogenie is a good smartphone manager that allows seamless import and export of contacts, conversion and moving videos and music files as well as it can even unlock your Android phone with the option to root your Android phone. Although the app offers a lot of functionalities, it is plagued with In-App ads and random pop ups showing ads. It is a ad-supported freeware. It also froze for few seconds while I was transferring a moderate sized video file to the phone. But altogether, this is a great app for those who don't want to rely on online services like those offered by Google to sync contacts and other files and have no time for converting video or audio formats to supported formats for the phone and again copying to the device manually into SD card. It is better and fast in transferring files to the device compared to some of the similar applications available.